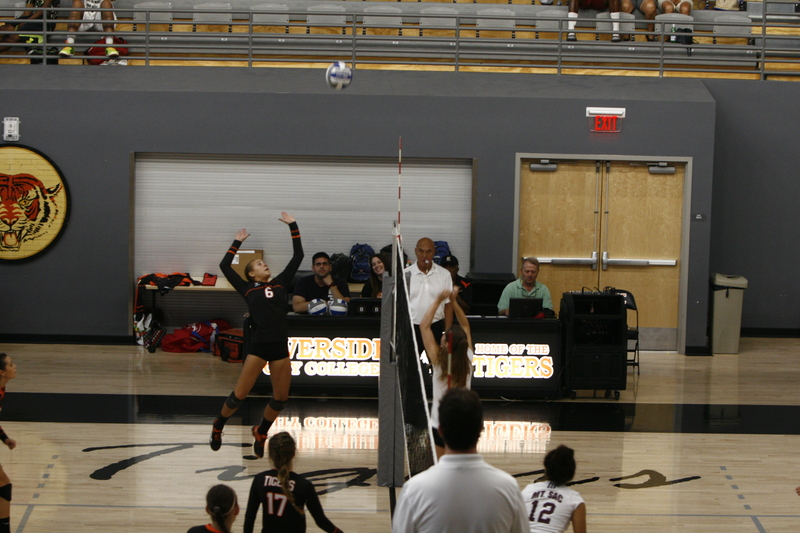 Freshman outside hitter Lauren Wells started her Riverside City College volleyball career on an incredibly high note. Wells is leading her team in kills this season with 92 as of Oct.6 and is one of the top performers in digs with 68. Aside from her well-rounded athleticism, what makes Wells such a vital asset to this team is her sweet demeanor and caring nature. The 18-year-old from Woodcrest Christian High School has played volleyball since age 10. In her debut season with the Tigers, Wells currently has 105 points, 255 total attempts, with only 22 errors. In RCC’s first nine matches throughout the season, Wells had the most kills in seven of the games, tied for most kills in one game, and had the second most high kills in the remaining game. Wells started the season strong by getting her season high in kills, 16, in the second game of the season opener coming against San Jacinto. From there on, she has continued to have a dominating season. Despite having such a strong season, there are still aspects of her game that Wells would like to improve upon. Her teammate second year setter Melissa Moe, it is noted that although Wells herself is more on the quiet side, her ambitious nature is not. Head Coach Monica Hayes-Trainer had high praises for her young player as well. When asked what positive contributions Wells brings to the program this season, Hayes-Trainer without hesitation had tremendous compliments. “We could start with her mental game, her physical game, her emotional game. We’ll start with physical; she is a great athlete. She’s got incredible jumping ability,” Hayes-Trainer said. Hayes-Trainer went into detailed statistics stating something she has noticed about Wells is her efficiency and consistency during the games they have had this season. Like Moe, Hayes-Trainer has also taken note of Wells’s “quiet confidence” and overall thinks it builds on to her being the humble and great teammate she has been so far. With a strong start to her rookie season at RCC, high praise, support from her teammates, coaching staff and a selfless attitude, Wells has all the makings for a sound experience as a Tiger. She and RCC look to add to its season of triumphs going into the last two months of the season.